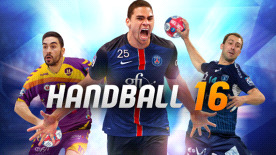 Handball 16 ©2015 Bigben Interactive. Published by Bigben Interactive. Developed by Eko Software. D1 logo and name are protected trademarks of the Ligue Nationale de Handball. ASOBAL is a registered trademark and property of the Association of Clubs SPANISH HANDBALL . The logo and name are registered as ASOBAL brands. Logos , names and clubs shirts Bauhaus ASOBAL are registered Handball club of the maximum Spanish category Men's Handball brands. The image rights of Spanish Handball competitions : Supercopa ASOBAL , ASOBAL Cup and Copa del Rey Handball owned by ASOBAL. HBL-German League. All rights reserved. The information displayed is the property of the Handball Bundesliga GmbH. It depicts correct information at the time of publishing. They are not liable for the accuracy, correctness and completeness of the information and data provided. Handball 16 uses Havok®. ©Copyright 1999-2015 Havok.com, Inc. (and its Licensors). All Rights Reserved. See www.havok.com for details.